We are currently inviting new members and families to join our active and friendly club. Membership, just £80 for Adults for the entire year, can be activated within 24 hours. 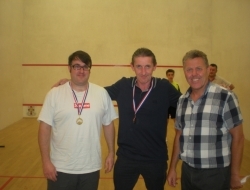 Email lindumsquashmembership@post.com or download a membership application form in our membership section. Off peak Pay & Play Options (subject to court availability) for non members also available. Ring 01522 526592 for further information. Lindum Squash Club is part of Lindum Sports Association, an extensive sports facility in the centre of Lincoln, which also includes cricket, hockey, bridge and a gym. We have 3 courts, including a glass back exhibition court with tiered seating, and a welcoming bar area, with a varying selection of real ales! The squash club have installed an on-line booking system enabling you to book your courts on your computer or phone/ tablet 24 hours a day and we have also recently refurbished our changing rooms which have excellent showers and changing facilities. We have also very recently (Sept 2016) installed new high quality LED lighting onto courts 1 & 2. All our courts have adequate heating systems for winter temperatures. We are proud of our facilities which are one of the best in Lincoln and we have recently received a silver accreditation award from ESR. Our squash coaches, Fran Wallis and Carolyn Roylance have many years experience and contact details can be found in the club. To see what coaching is available please see the coaching page. Social squash is played by members of all ages and abilities and for those wanting competition there are internal leagues on a monthly promotion/relegation cycle. We have 8 internal leagues including a ladies and racket ball league. Regular Club Nights offer the opportunity for all members to come along and play without prior arrangement. There is an active junior section and group coaching is available to junior members and non-members every Saturday morning with Fran & Carolyn. For more information see the coaching page. We also offer Pay & Play Options for non members who only wish to play off peak and at irregular intervals. Each evening, from 19.20pm, Saturday afternoons and Sunday (subject to availability) courts may be booked by non members for just £5 per court plus £1 per 10 minute session for the lights and heaters on the court. Simply call 01522 526592 to arrange pay and play bookings. Please use the menu above to find out more about the club, including details of current and recent events, social and match play, coaching and how to join.